Approximately, close to 10 lakh idols are immersed each year in India’s water bodies to mark the finale of Ganesh Chaturthi, Durga Puja, Saraswati and Chhath Puja festivals. A bulk of these idols is made of plaster of Paris (PoP) and chemical paints, which are non-biodegradable and insoluble in water. POP is actually a building material that heavily pollutes water and increases the water hardness multifold. Even the chemical dyes used to colour the idols contain heavy metals such as lead, mercury and cadmium. 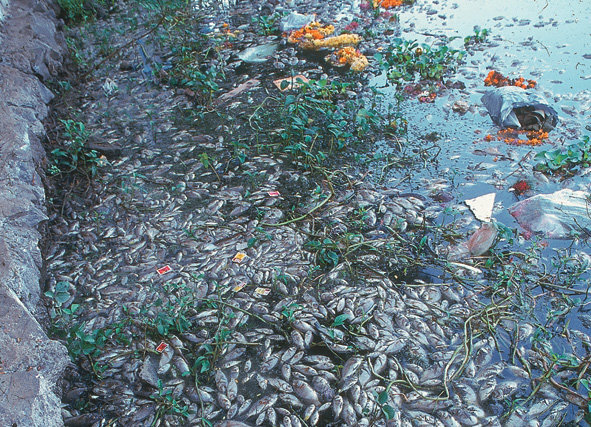 They contaminate plants, poison aquatic life and irrigation and drinking water. Government agencies tend to ignore environmental issues linked with religion, fearing they might hurt religious sentiments. Visceral fear is stronger than logic, or so it seems. It’s the same story every year as these festivals continue to leave their mark on the already toxic waterways in the shape of plastic bags, broken idols, metal accessories and other decorations. What I fail to understand is how something that is regarded as the most sacrosanct article during the ceremony can be so conveniently discarded like trash right after. The rivers should not be used to immerse idols and religious material (some statues are so huge they require to be lifted by cranes – imagine several hundred thousand of them in our rivers). There is something intrinsically wrong with the very people who give their gods a ‘send-off’ in filthy rivers in the name of ritualistic belief, turning a blind eye to the systematic decimation of the country’s lakes and rivers. The chief perpetrators are the organizers of these festivals who compete to make larger and overly glamourised idols each year. Decades ago, there were far fewer idols and those that were used for worship were made of clay, mud and grass husk and painted with natural and organic colours like turmeric. The extent of pollution from these celebrations was also minimal since water systems and dams weren't linked as is currently the case. 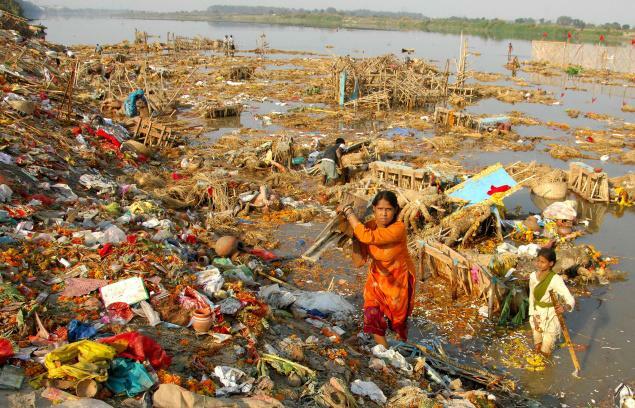 A visit to the Yamuna river front last year at the end of one of the aforementioned festivals involving idol immersion revealed the utter disregard to the appeals made by Prime Minister Narendra Modi as part of the Swachh Bharat Abhiyan campaign. The water stank, the banks were covered with plastic, idols, coconut husks, clothes and sundry other puja leftovers. Despite crores being spent for the Yamuna clean-up (Rs 6,500 crore to be specific), the river is still in an extremely deteriorated condition, especially around New Delhi, which dumps about 58% of its untreated or partially treated domestic and industrial sewage into the river. More horrifying is the fact that this ‘glorified drain’ meets 70 per cent of the city’s daily water needs. In 2010, the Central Pollution Control Board (CPCB) formulated guidelines recommending use of natural clay and natural dyes for idol-making, besides stating that flowers, clothes, and decorative material be removed before idols are immersed. Years of pleading for eco-friendly idols though, have not gone in vain. Rajasthan Mitra Mandal which makes puja pandals in Uppar Bazar area of Jharkhand made an eco-friendly pandal and idol last year. Having experimented with cashew peels and winning the best pandal award was enough motivation for them to go eco-friendly that point on. The materials they use for their pandals and idol making are simply wild fruits and dry fruit peels. 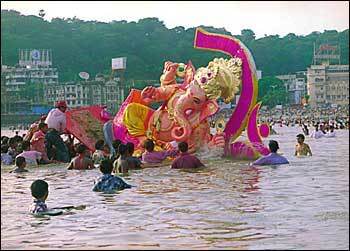 Similarly, organisers of a Durga Puja in Chittaranjan Park have decided against immersing idols in the river. The Dakshinpalli Durga Puja Samiti decided to invest in three 12-ft steel tanks and immerse the idols in them within the pandal premises. The committee even consulted the priests to ensure they are not violating any traditional rituals and are maintaining the symbolism of the event. Goa is the only state in the country that has imposed a total ban on the sale, manufacture, transportation and use of idols made out of PoP, and has penal provisions. They have rigorous checking routines in place to prevent this potentially hazardous material from making its way into the state. It's a good sign that authorities are beginning to take responsibility. If replicated in large numbers, such efforts can go a long way in reducing the load of pollution in our water systems. Revising guidelines to make them stringent as well as developing a water quality monitoring mechanism are necessary steps to mitigate the effects of pollution from religious practices. Generating public awareness on the plight of our rivers and lakes through an intelligent and impartial media campaign can definitely yield a complete physiological shift in social mindset. Until that happens, it is business and pollution as usual.